The sept of Macnaghten, in Argyllshire, is acknowledged by the highlanders, according to Alexander Nisbet, to be one of the oldest in the west of Scotland, and its members were for centuries involved in the political transactions of that kingdom. SHANE DHU, third son of JOHN MACNAUGHTANE, of that ilk, and grandson of SIR ALEXANDER MACNAUGHTANE, who fell at Flodden, went over to Ulster as secretary to his kinsman, the 1st Earl of Antrim, and settled there. EDMOND MACNAGHTEN, of Beardiville, County Antrim, was born in 1679. EDMOND ALEXANDER MACNAGHTEN (1762-1832), of Beardiville, and Duke Street, St James's, London, MP for County Antrim, and a Lord of the Treasury. Sir Francis received the honour of knighthood on being appointed a judge of the supreme court of judicature at Madras, in 1809, from which he was transferred to that of Bengal, in 1815. He retired from the bench in 1825, and was created a baronet, 1836. 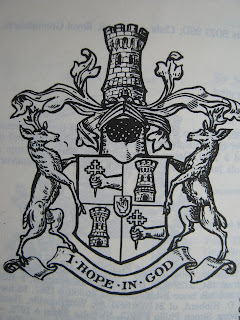 He had assumed, in 1823, the additional surname and arms of WORKMAN, and in 1832, had succeeded to the chieftainship of the CLAN MACNAGHTEN; and the patrimonial estate of Beardiville, at the decease of his brother, Edmund Alexander Macnaghten. SIR EDMUND CHARLES WORKMAN-MACNAGHTEN, 2nd Baronet (1790-1876), succeeded to the property. Like his father, he, too, made a fortune in India; and, having retired at the very young age of 24, decided to replace Bushmills House with a much grander mansion. He commissioned Charles Lanyon to construct the present, very fine Italianate mansion, DUNDARAVE, in 1846, based on Barry’s Reform Club. The Rt Hon Sir Francis Edmund Workman-Macnaghten (1828-1911), 3rd Baronet, was a Privy Counsellor. became a Law Lord as the Baron Macnaghten in 1887. He was admitted to Lincoln's Inn in 1857 entitled to practice as a barrister; appointed QC in 1880; was MP for County Antrim, 1880-85; MP for North Antrim, 1885-87; a Privy Counsellor, 1887. He was a Lord of Appeal in Ordinary, 1887. In 1887, Sir Edward was created BARON MACNAGHTEN. He was also Bencher of Lincoln's Inn in 1907. Sir Edward Charles Macnaghten was 5th Baronet (1859–1914). Sir Edward Harry Macnaghten, 6th Baronet (1896–1916), died in 1916 aged 20, reported missing in action, believed killed. He was a 2nd Lieutenant in the Royal Highlanders (The Black Watch), attached to the 12th Battalion, Royal Irish Rifles; fought in the 1st World War. Sir Arthur Douglas Macnaghten, 7th Baronet (1897–1916), died in 1916 aged 19, killed in action. He was a 2nd Lieutenant in the 8th Battalion, Rifle Brigade. Sir Francis Alexander Macnaghten became the 8th Baronet (1863–1951); succeeded by Sir Frederic Fergus Macnaghten, 9th Baronet (1867–1955) and Sir Antony Macnaghten, 10th Baronet (1899–1972). Sir Patrick Alexander Macnaghten DL, 11th Baronet (1927-2007) was educated at Eton and Trinity College, Cambridge; worked as an engineer and manager with Cadbury's Chocolate. He succeeded to the Baronetcy and as Chief of the Name and Arms of the Clan Macnaghten in 1972. On his retirement he lived at the estate of his ancestral home Dundarave until 2005. He was a Deputy Lieutenant and Vice-President of the Northern Ireland Ploughing Association; and a member of the Fisheries Conservancy Board. Sir Malcolm Macnaghten is the present 12th Baronet (b 1956). In 1862, the Macnaghtens had a London town-house at 18 Eaton Square. John "Half Hanged" was 1st cousin to Sir Francis Workman-MacNaghten, I Baronet of Dundarave, their shared grandparents were John MacNaghten of Benvarden and his wife Helen Stafford. John's grand nephew Robert Cary Hamilton MacNaghten of Mountjoy Square Dublin married Mary Orr, first cousin of Mary Rippingham of Dublin the daughter of the Rev. Henry Wilson Rippingham, Vicar Coral of Castleknock in St Patrick's Cathedral and his wife Jane Bourcicault, who was Matron and Housekeeper of the Dublin Lying-in Hospital. Mary Rippingham funded and ran one of the first schools in Coleraine. She died in 1870 at the age of 91 and is buried in the Bristow family grave at Drumbeg Parish Church, along with James Rippingham Bristow and his aunt Mary Rippingham Bristow and the rest of the Bristow family of Wilmont House. Mary left her portfolio of 8 houses in Dublin to her cousins, the two daughters of Robert Cary Hamilton MacNaghten and Mary Orr. My family is trying to track an ancestor who came from the MacNaughten estate in the Bushmills area. They McNaulls were Presbyterians and overseers on that estate. Two brothers came to Ohio in the United States in the early 1800s; another brother and the father were still on the estate when the father, John, died in 1820. Advice is to pursue the estate records for references to these McNaulls and perhaps be able to work backward to other relatives we have not yet identified. To do that we need to know the titles and names of the owners of the land at various points in the 1700s and early 1800s. Frances MacNaughten and wife Letitia Dunkin have been cited as owners who greatly expanded the Bushmills village on their estate. Do you have any details about this land or the estate ownership that can help us?